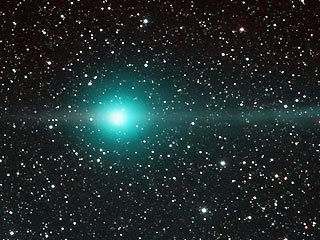 Comet C/2007 N3, better known as Comet Lulin, is having its apogee (closest approach to the Earth) this evening. Earlier tonight I went out with a good pair of binoculars and found it in the west-southwestern sky, to the right of Saturn (Fox News has more on where to find it). Out in the darkened countryside, with a clear sky and a cold night (meaning less air turbulence), Lulin could easily be picked out with the naked eye and with binoculars, the greenish tint of this very strange comet - it's also traveling backwards from where the tail should be, by the way, and retrograde (opposite) of the direction of the planets - was readily discernible. So far as comets go, Lulin is certainly the best naked-eye viewing since Hale-Bopp back in 1997. Lulin will still be visible for a few days: catch it if you can, 'cuz it's going way out there and probably won't be back for a million years or so.